Upfront > d i v e r s i t y w o m a n . c o m Fa l l 2 0 1 4 D I V E R S I T Y W O M A N 13 Foreign Affairs N owadays, cultural compe- tency goes well beyond learn- ing to interact with those from diferent cultures who have come to work in the United States. Increasingly, as American employees work abroad, they must learn to interact in an international business community— which often means navigating multiple cultural mores. Michelle Gadsden-Williams, the managing director and global head for diversity and inclusion for international banking powerhouse Credit Suisse, is well versed in these complex cultural competencies and knows how to de- velop the skills needed to operate in the international business arena. A seasoned diversity practitioner with more than 20 years' experience working in the pharmaceutical indus- try before transitioning to fnancial services, she has received many honors, including the 2010 Maya Way Award for Diversity Leadership, presented by Dr. Maya Angelou. 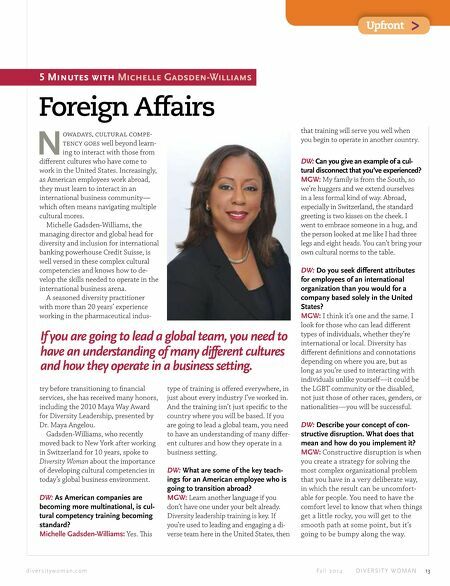 Gadsden-Williams, who recently moved back to New York after working in Switzerland for 10 years, spoke to Diversity Woman about the importance of developing cultural competencies in today's global business environment. DW: As American companies are becoming more multinational, is cul- tural competency training becoming standard? Michelle Gadsden-Williams: Yes. Tis that training will serve you well when you begin to operate in another country. DW: Can you give an example of a cul- tural disconnect that you've experienced? MGW: My family is from the South, so we're huggers and we extend ourselves in a less formal kind of way. Abroad, especially in Switzerland, the standard greeting is two kisses on the cheek. I went to embrace someone in a hug, and the person looked at me like I had three legs and eight heads. You can't bring your own cultural norms to the table. DW: Do you seek different attributes for employees of an international organization than you would for a company based solely in the United States? MGW: I think it's one and the same. I look for those who can lead diferent types of individuals, whether they're international or local. Diversity has diferent defnitions and connotations depending on where you are, but as long as you're used to interacting with individuals unlike yourself—it could be the LGBT community or the disabled, not just those of other races, genders, or nationalities—you will be successful. DW: Describe your concept of con- structive disruption. What does that mean and how do you implement it? MGW: Constructive disruption is when you create a strategy for solving the most complex organizational problem that you have in a very deliberate way, in which the result can be uncomfort- able for people. You need to have the comfort level to know that when things get a little rocky, you will get to the smooth path at some point, but it's going to be bumpy along the way. type of training is ofered everywhere, in just about every industry I've worked in. And the training isn't just specifc to the country where you will be based. If you are going to lead a global team, you need to have an understanding of many difer- ent cultures and how they operate in a business setting. DW: What are some of the key teach- ings for an American employee who is going to transition abroad? MGW: Learn another language if you don't have one under your belt already. 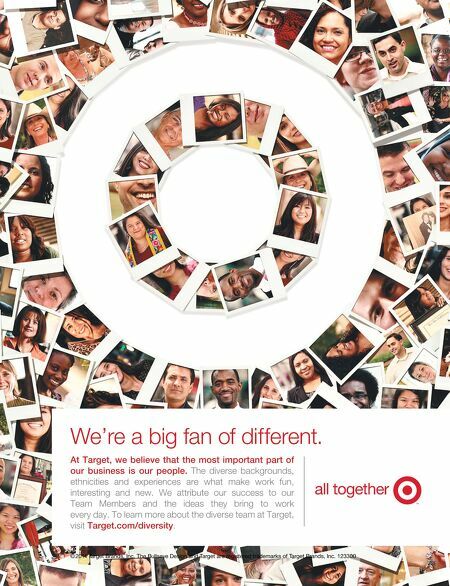 Diversity leadership training is key. If you're used to leading and engaging a di- verse team here in the United States, then 5 Minutes with Michelle Gadsden-Williams If you are going to lead a global team, you need to have an understanding of many different cultures and how they operate in a business setting.